Younger women generally do not consider themselves to be at risk for breast cancer. However, breast cancer can strike at any age, and women should be aware of their personal risk factors for breast cancer. Diagnosing breast cancer in younger women (under 45 years old) is more difficult because their breast tissue is generally denser than the breast tissue in older women. In addition, breast cancer in younger women may be aggressive and less likely to respond to treatment. Also, women who are diagnosed with breast cancer at a younger age are more likely to have a mutated (altered) BRCA1 or BRCA2 gene. Delays in diagnosing breast cancer also are a problem. Many younger women who have breast cancer ignore the warning signs – such as a breast lump or unusual discharge – because they believe they are too young to get breast cancer. Some healthcare providers also dismiss breast lumps in young women as cysts and adopt a "wait and see" approach. Although breast cancer might not be prevented, early detection and prompt treatment can significantly increase a woman's chances of surviving breast cancer. More than 90 percent of women whose breast cancer is found in an early stage will survive. When women learn at a young age about the risks and benefits of detecting breast cancer early, they are more likely to follow the recommendations regarding clinical exams and mammograms. Young women also need to understand their risk factors and be able to discuss breast health with their healthcare providers. Should Women Under Age 45 Get Mammograms? In general, regular mammograms are not recommended for women under 45 years old, in part, because breast tissue tends to be denser in young women, making mammograms less effective as a screening tool. In addition, most experts believe the low risk of developing breast cancer at a young age does not justify the low level radiation exposure or the cost of mammography. However, screening mammograms may be recommended for younger women with a family history of breast cancer and other risk factors. What's the Best Way for Younger Women to Screen for Breast Cancer? The American Cancer Society recommends that all women 20 years of age or older should perform a monthly breast self-examination (BSE). The best time to perform a BSE is the day after a woman’s monthly period ends. Becoming familiar with the look and feel of their breasts offers the best chance for a young woman to notice any change. In addition to a monthly BSE, annual clinical breast exams are recommended for all women beginning at age 20. Annual screening mammograms are recommended at age 45 and personalized. 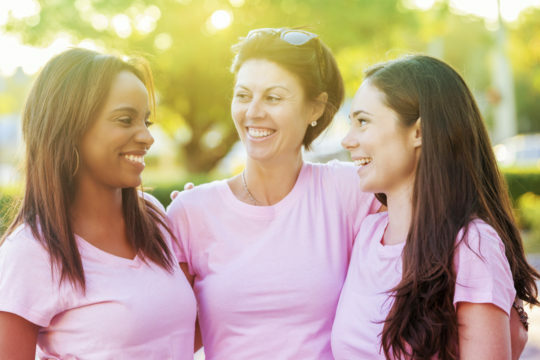 Women younger than 45 who have a family history or other risk factors for breast cancer should discuss their risk and an appropriate screening schedule with their healthcare providers as they need more intensive screening.